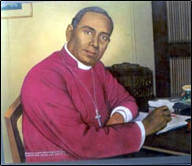 Bishop Vedanayagam Samuel Azariah (August 17, 1874 – January 1, 1945), simply known as V. S. Azariah, was an Indian Anglican bishop. He was also a very important pioneer of Christian ecumenism in India. Azariah became the first Indian bishop in the churches of the Anglican Communion when he was consecrated in the diocese of Dornakal, December 1912. Interestingly, he was considered by Gandhi to be postcolonial India’s “Enemy Number One” because he followed Jesus first, not the politics and culture of the West. Like so many young men in his era Azariah was converted to faith in Christ through the work of the YMCA. He became a YMCA evangelist before he was made a bishop in 1912. From 1895-1909 he was the general secretary of the YMCA in south India. He came to believe that indigenization was central to the fruitful ministry of Christianity in his native country. Azariah saw that the very mission of the Church should be an expression of its unity. (This is what I mean by the term missional-ecumenism in my book, Your Church Is Too Small.) This is why he took a leading role in negotiations for Church reunion in India. These efforts were not fulfilled in his lifetime but through the efforts of many, including the greatest missionary of them all, Lesslie Newbigin. These efforts resulted in the inauguration of the Church of South India in 1947, two years after his death. Newbigin became the first bishop of this united church. Speaking to the landmark World Missionary Conference in Edinburgh (1910) Azariah connected love and friendship in a way that appeals very deeply to me because of the work that I am doing on my book on love. Through all the ages to come, the Indian Church will rise up in gratitude to attest the heroism and self-denying labors of the missionary body. You have given your goods to feed the poor. You have given your bodies to be burned. [but…] We ask for LOVE. Give us FRIENDS. (World Missionary Conference, vol. 9: To Consider Missionary Problems in Relation to the Non-Christian World, 315). I love that quote at the end.